This mobile friendly eCommerce web site was created for Chicago based OperationHeatJac. 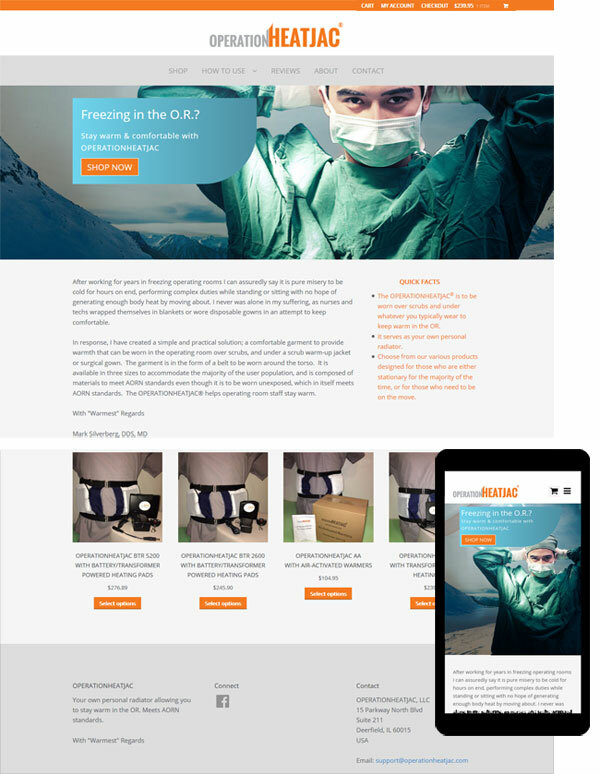 We created their logo and a very clean look and feel to their site which sells a novel personal warming device for O.R. staff who suffer in the cold working environment. “Indigo Image did a great job in creating my company’s website, operationheatjac.com as well as in designing the logo. The appearance and functionality are just perfect, and I have received many compliments from those who have seen the site. Zoe Feast is very talented, creative, and easy to work with, all necessary qualities when creating a website that will stand out. She really knows how to create an e-commerce website.